With this code I’ve ditched the idea of having a separate collision mask. For now. 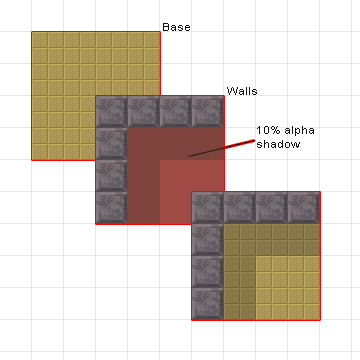 Using my own example of a 16×16 tree casting a shadow across a 32×32 tile graphic and the player sprite therefore potentially colliding with the shadow when the tree is the only physical obstruction – I have opted to either draw the graphics as 4 separate tiles or simply ditch the support for such an elaborate feature. If you highlight one of my simple tiles and click “set as floor” you can quickly get a feel for how you level will look. Then click to select a tile to paint with, ensure that the mode is set as Brush and click away. I don’t currently support dragging the mouse around the level with the button down. For each tile you can set two parameters just now. CanPass and Damage. Finally when you’ve finished click the “generate level data” button to output the JSON structure to the textarea bottom right. There are no game entities just now just obstructions. That comes next. Interested in feedback and suggestions. 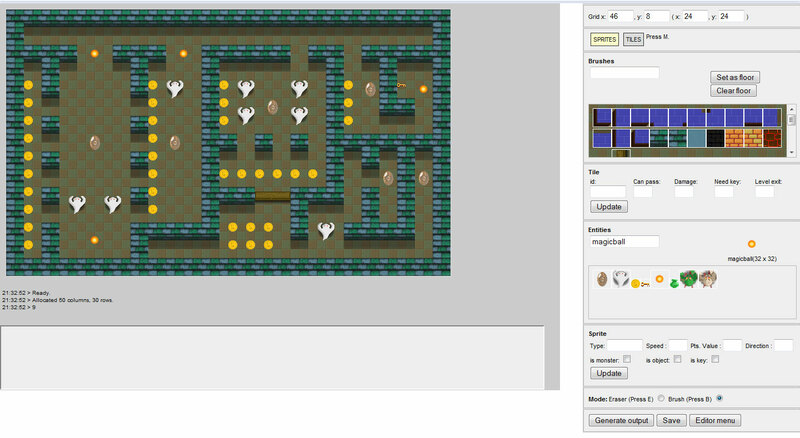 Something that I have been giving some thought to lately is a detailed level editor. In the past I have deliberately crafted games that offer the same structure but with only slight variances. In Invaders from Mars the aliens offered slightly different patterns, for example. In Hoth Strike the number of rebel soldiers increased. Essentially the core game mechanics remained the same. That is, the puzzles didn’t vary in style or complexity. But I want to move beyond that. I want to offer games that have been designed with a more immersive level of play. The only way to achieve this is to create a tool that allows me to position obstacles, challenges, rewards, monsters and power-ups. Furthermore I want to be able to literally paint the screen with decorations (platforms, walls, tiles) independently of the game’s consideration for what should and shouldn’t be a collision. So I’ve been putting together some ideas based on applying layers to my games. Since I am working on a Gauntlet style top-down game just now I figured it best to illustrate my thoughts with that style in mind. As you can see in the illustration above the level starts out with a simple floor covering. This is a general carpet effect most probably achieved using the CSS backgroundImage style set to repeat; In my editor I select the floor tile to paint the scene with. Then I move up a layer to the decoration. I intend to work with a minimum of 16 x 16 scaled tiles here. When the two layers are combined you can see that I get a satisfactory amount of detail. The game code will handle any scrolling through the viewing window where the level is larger than the canvas dimensions and literally stitch the two levels together. 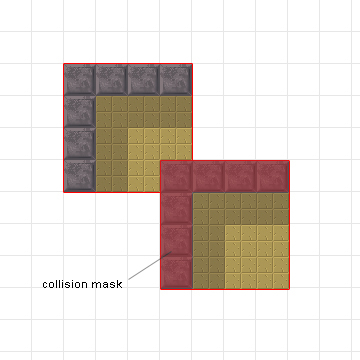 The final part of the puzzle is the collision layer. Here I need to instruct the game code where in the level cannot be crossed. Walls, doors, tables etc all need to be “painted” with the collision mask. The red area forms the collision area. 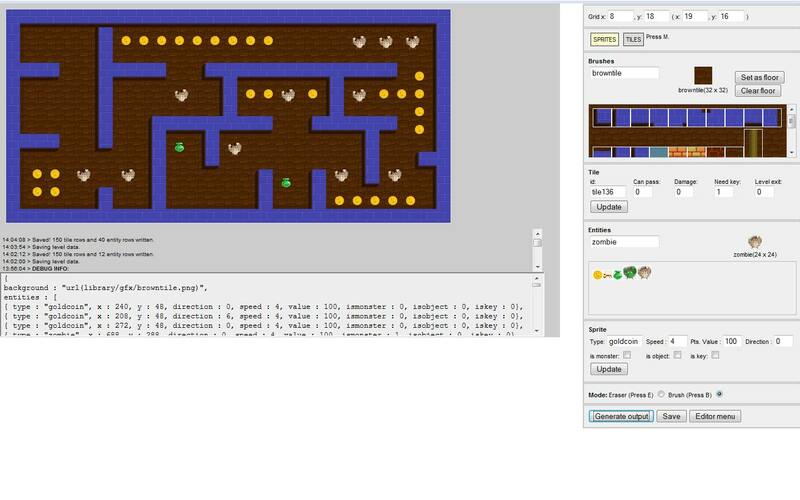 Additional attributes in the level editor will inform the game code just how to handle collision with the region. For example I may wish to make a wall electric or red hot. I can assign a pain value to the wall. Either way I have some information to work with in the game code. Future developments may see additional detail such as ambient sound effects or spawn effects. Of course I need to consider such things as output format such that the level data can actually be used. I’m pretty sure that JSON formatted text files are the way to do it. Interested in feedback from anyone with similar experience.